Baker Mayfield just finished his rookie season at Cleveland. Online Photo. Above you’ll read a classic scouting profile on Baker Mayfield. His player profile highlights his expertise as a football player. You will not find many who will debate his dominating physicality on the field. 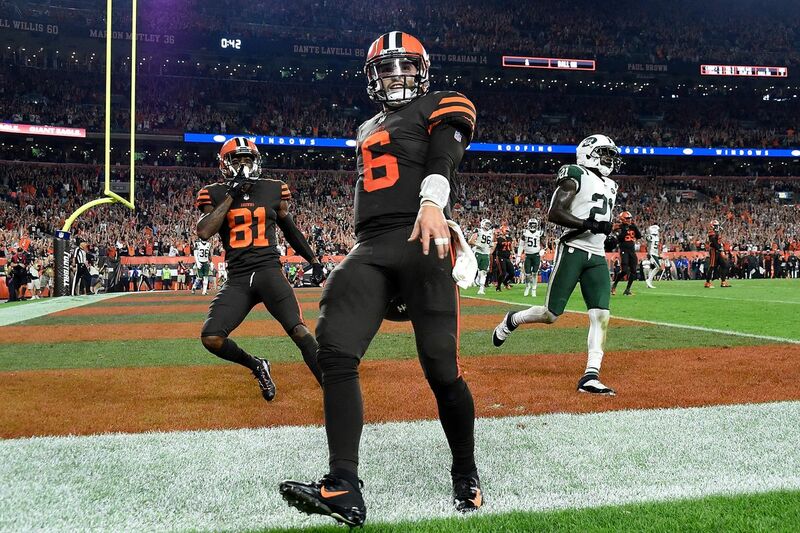 When the Cleveland Browns selected Mayfield as the number one pick in the 2018 NFL Draft Mayfield’s high-caliber talent was solidified. While playing his final college season at the University of Oklahoma, Nathan Berg, the assistant Sports Editor at The Red&Black, the University of Georgia’s publication, said Mayfield’s stats reflected his superior talent on the field. Across the board, football critics label Mayfield as the best quarterback drafted in 2018. Few people debate the skill, athleticism and superior ability of Mayfield. However, the question arises: what one trait sets Mayfield apart from the 82 other skilled quarterbacks employed by NFL? Throughout his entire football career, Mayfield chased football success. As a junior, he led his high school, Lake Travis in Austin, Texas, to its fifth consecutive state championship title. During his senior year, the team finished 9-2 with a District Championship title. After college, Mayfield walked-on at Texas Tech University, where he won the starting quarterback position and started seven games as a true freshman. Following one season at Texas Tech, he transferred to the University of Oklahoma, where he sat out for a year due to NCAA rules. At first, Mayfield earned no money to play college football. After a year of playing for free, most walk-ons abandon their dream of playing at a collegiate level. Not Mayfield. He fought and earned the starting position. Then, he willingly sat on the sidelines for a full year all in the name of chasing greatness; yet, sitting out did not limit Mayfield. Every game Mayfield stood proudly on the sideline encouraging his team. Times Record, out of Fort Smith, AR, said Mayfield stood on the sidelines of every game in a ball cap and jeans cheering on his Sooner teammates. During his senior season at the University of Oklahoma, Mayfield won the Heisman Trophy, which is awarded annually to the most outstanding player in college football in the United States. Number One Pick in the NFL Draft. However, Mayfield’s winding path to greatness exemplifies the inner fight and zeal which sets him apart. Like most other college football walk-ons, Mayfield could have quit. Instead, he fought for success, something he so desperately desired. Whether he is planting the University of Oklahoma’s flag in the middle of Ohio State’s field, dancing with his teammates or making a championship drive down the field, Mayfield ardently pursues football, more than any other player in the NFL.